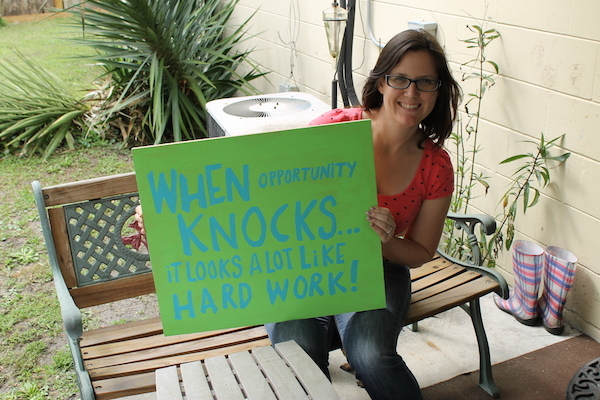 Now that our floors are complete (yes, I know I still owe everyone our “After” pictures), I’ve been ITCHING to get back into my crafting. Unfortunately, my craft room is still in disarray and many of my supplies are living in boxes scattered throughout the garage and attic. Despite that obstacle, however, I still managed to compile a pretty extensive list of Valentines-themed projects I’d like to tackle before February 14th. Not sure if I’ll get to all of them, but if I can at complete three or four, I’ll feel pretty accomplished. The first (and consequently the most time-consuming), is this adorable “Be My Valentine” pattern from Red Heart. When I stumbled across the pattern on Pinterest earlier this week, I immediately created a V-Day themed board, printed off a .pdf of the pattern, and went out that night to pick up the appropriate yarn. I’m currently about four rows into the project (out of 82), and hoping that I can cross it off my craft to-do list by next Sunday, February 3. While that may seem like a pretty quick turn-around, I find that I’m always more successful with my crochet projects when I give myself a deadline. I haven’t crocheted in awhile, and I’m definitely feeling a little rusty, but this project couldn’t have come at a better time, as one of my coworkers commissioned me for a smaller project earlier this week! I think one of the reasons I’m so determined to jump into the deep-end with Valentines-themed crafting is that I was very disappointed by not being able to decorate much for Christmas this year. Because of the state our home was in due to the flooring project, and our trip to Seattle over the holidays, I wasn’t really able to get into the Christmas spirit other than hanging my stockings over the fireplace and putting a wreath on our door. I’m also getting ready to roll into an array of baby showers, bridal showers, bachelorette parties and weddings, so if I don’t craft now, I’m not likely to get the chance again until June! Because we missed out on even sending Christmas cards this year, I’ve been toying with the idea of sending out personalized Valentines greetings instead. I really love these valentine photo cards from delia creates, and am hoping I can talk Chris into posing with me to create something similarly cute (perhaps mimicking some of the poses from my “Cutesy Couple Photos” board on Pinterest). So, I saw this originally on More Design Please (which is a great compilation of art, design, crafting and more), but eventually traced the original tutorial back to Green Wedding Shoes. 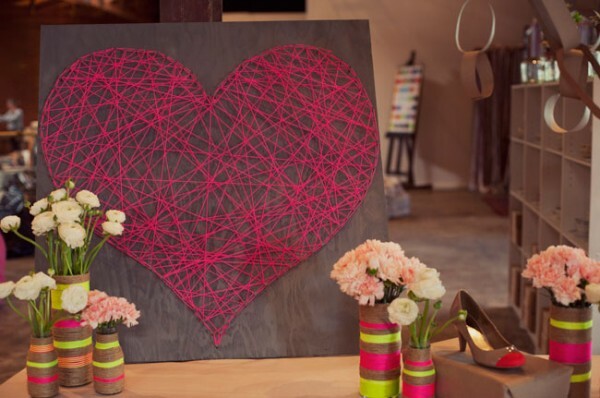 They put together a great post that walks you through each step of creating the string heart accompanied by stunning photos (courtesy of Katherine Elizabeth Photography) such as the one below. What I love about this project is that it’s simple, but dynamic, and it’s also reminiscent of a project I did for geometry back in the fifth or sixth grade. While purchasing yarn for project number one, I went ahead and purchased pins and embroidery floss to ensure that this project made the final cut. Updates as soon as I have them! 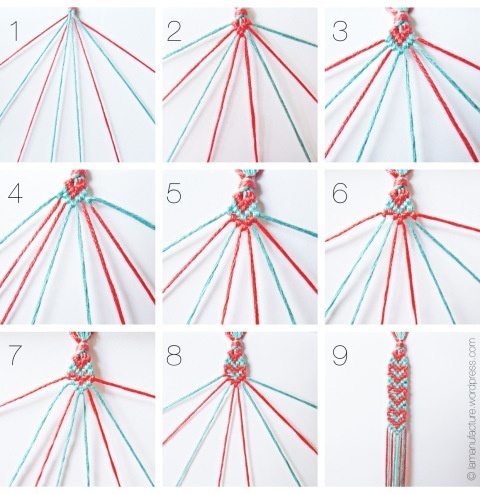 My little sister LOVES making friendship bracelets, so I thought it would be neat to gift her one on Valentines using the pattern I found below. Because I know she’ll be wowed by the little hearts, I’ll be including the pattern when I give it to her, so she can in turn, impress her friends! 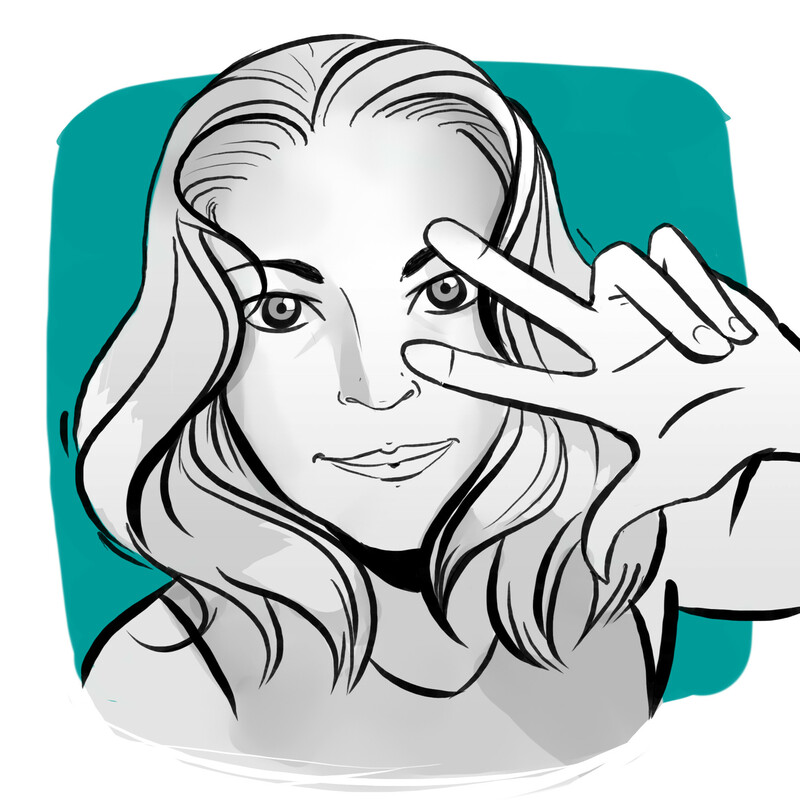 I found the pattern over on La Manufacture, and she includes a great video tutorial in addition to the graphic below. 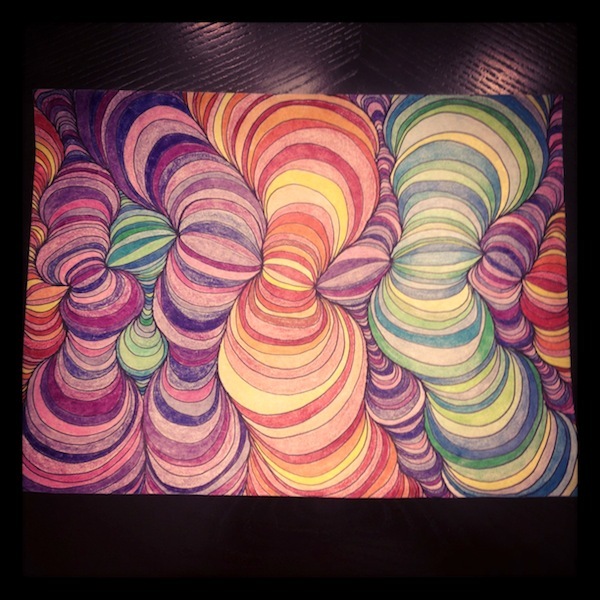 For some variations on the theme below, I definitely recommend checking out Pearls, Handcuffs and Happy Hour to see how she incorporated a variety of frames/layouts into her project. She was also brilliant – using sheet music scrapbook paper (when I first saw the image, I despaired because I didn’t have any sheet music handy, and was afraid I was in for a long search). 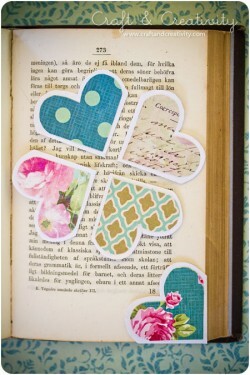 For all my book-lover friends, these little heart-shaped corner bookmarks are a MUST! I found the tutorial over on Craft and Creativity. 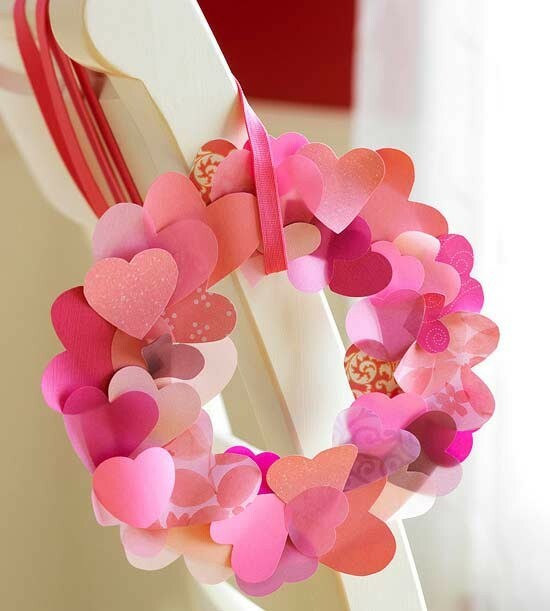 This heart wreath was embedded in a slideshow of more great Valentines ideas from Better Homes & Gardens. In addition to the crafts I’ve listed above, I also have a secret craft I stumbled upon that I’m DEFINITELY going to be making, and since several of the people who occasionally trip across these pages may perhaps be a recipient of said-craft, I’m going to hold off on sharing what it is until Valentines Day. What crafts have made their way onto your to-do list? We can do cutesy valentines pictures. They will be so adorable that socks will be knocked off. So full of love faces will be melted. 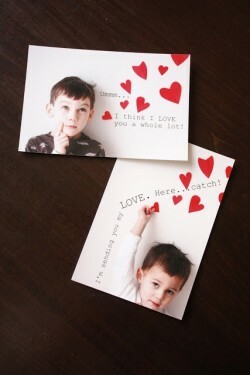 I loooooove those Picture Me Valentines! So cute. 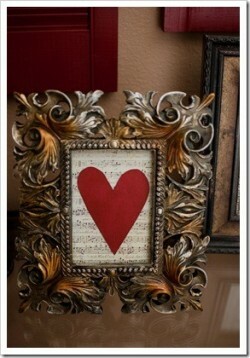 I’m really excited for Valentine’s Day this year (totally shocking, I know), so I’m sure I’ll be crafting it up.